Q. How do I download a book from Ebook Central? Titles in ProQuest Ebook Central can be downloaded to your computer or device for a limited period of time. After the period has expired you can repeat the download process again and continue to read off line. In order to download titles, you need to install Adobe Digital Editions, which is software that is available free of charge. You will be prompted to install this program as part of the download process if it has not been installed beforehand. Please allow a few moments for the file to download. The Adobe Digital Editions program should automatically open and you should be able to read the downloaded book at that point. Depending on the browser you are using, once you download the ACSM file, if Adobe Digital Editions does not automatically open, the file may still be sitting under Downloads in your browser. 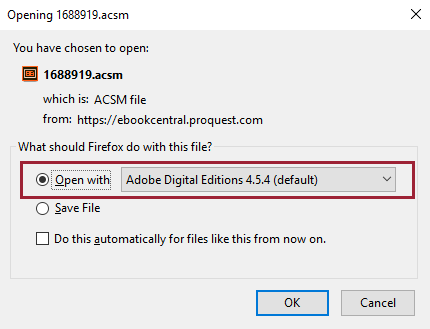 If you click on the ACSM file from Downloads, this should prompt the Adobe Digital Editions program to open with the ACSM file. How do I authorize my computer to download my textbook?